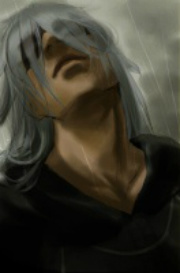 Dear Kuraikage, I am terribly sorry for the recent troubles involving one Luke Yasenha and myself. I have been demoted over this and other infractions that you will likely have heard about, as my squad is currently in your country for training. I would like to join them, if possible. I would be under the watch of one Emiko Sabure, my sensei as I am now but a Genin. With this letter, I send my deepest apologies and hope that there are no hard feelings. Sincerely, Okami Uchiha. The seal on the letter would be red wax in the shape of a Sharingan with a single Tomoe. It would be done on traditional vellum as befitted such a letter, hand inked in formal Kanji script. It was a work of ark, and had taken Okami well over an hour to create. It was while out on his mission with his 3 students that a pigeon approached and landed. Alec halted and allowed the pigeon to land on an index finger. He saw a message attached to one of it's legs. Alec took the message and read it. There was no expression on Alec's face. Reaching into his bag to remove from it a piece of writing paper and something to write with, Alec responded. With recent revelations of what happened in Morigakure between you, a Suna Hari, and a Miyuki Kamizuki, and revelations of your recent behavior, I'm going to have to deny your request. While I myself have no hard feelings towards you, there is a trust factor, and seeing as you have - as it was told to me - been behaving like power hungry Uchiha of old, you cannot be trusted. More time must pass for you to reflect upon your mistakes before you are allowed back into Kurayamigakure. I would highly advise against showing up here anyway. In the next negative confrontation with any of my people or myself, you are not guaranteed to walk away with your life. I will periodically be in touch with Temaki in regards to your progress. He attached the message to the pigeon and sent it back from where it came. Receiving the pigeon back during lunch, Okami sighed miserably. He didn't want to go there without his permission, so honestly there was no way he would get to join his companions. He had far to go mentally before he was ready to be promoted to Chuunin again, so he felt like sticking with the squad, even if he did get promoted. As to the accusation of acting like his ancestor, he looked briefly to the legend's ashes before sighing again. He didn't want to become /that/ man. He was proud of his ancestry, yes, but he was not proud of what the man had done. Cue his continuing with lunch, and subsequent meditation.